Ford Mustang attained an appalling two stars in the European New Car Assessment Programme (Euro NCAP). The European version of the Mustang missed out on some safety equipment which is available in American spec and this was the major cause for the disappointing results for the American muscle car. The Mustang is truly a global product from Ford and hence it needs to adhere to different crash tests around the world. 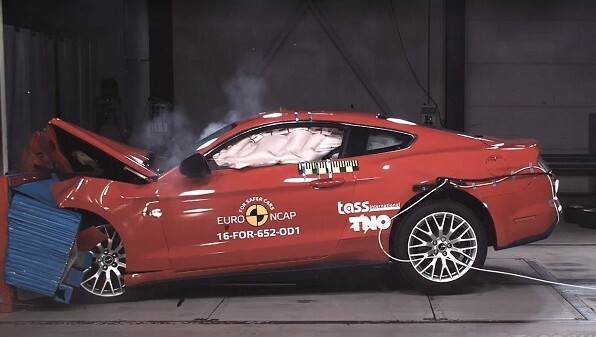 The Euro NCAP results were contradictory to the crash tests carried out by National Highway Traffic Safety Administration (NHTSA) in America, where the Mustang was awarded full five stars. It also scored ‘acceptable’ rating in tests conducted by Insurance Institute for Highway Safety (IIHS). The American muscle car scored poorly in both adult and child safety category with 72 and 32 per cent respectively. According to NCAP, the driver and passenger airbags were insufficiently inflated to restrain the occupants, seatbelt pre-tensioners and load-limiters didn’t work effectively, and the curtain airbag failed to provide enough cushioning in the frontal offset, full-width frontal and side-impact tests. The omission of safety equipment like Pre-Collision Assist, Forward Collision Warning system, lane assist and rear seatbelt pre-tensioners and load limiters contributed further as it scored only 16 per cent in safety assist category. The facelifted Mustang, which was showcased a few days back, will start making its way in Europe late this year. Ford promises that it will get several safety features as standard. The new Mustang can hopefully fare better when it undergoes the Euro NCAP next time.